OSM presents workshops in school settings, in your home or in larger community venues. All materials are provided, though donations of materials are accepted and greatly appreciated! 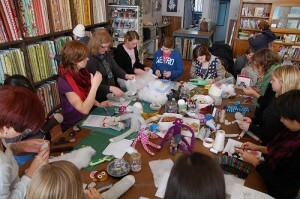 Check out the OSM events page for an upcoming workshop lisitings. A private workshop can be booked and is a great activity for baby showers, birthday parties, or just a get-together for a good cause. OSM will come to your school or community group and give a brief presentation on Clowns Without Borders and a workshop on sock-monkey making. The sock monkeys can be kept for a cash donation or given back to OSM for inclusion in the sponsor group. A sock-monk -a-thon is a workshop on the art of sock-monkey making open to the general public. 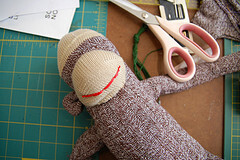 Crafters can make a donation to OSM and keep their sock monkey or donate it to the Sponsor group to be sent to South Africa. Contact Us for more info or to book a workshop.